It's raining here has been for the last day, I guess we need the rain. I don't have to water any of my plants outside. I really can't complain, my daughters graduation was on the weekend and the weather was absolutely gorgeous. The sun was shining, my daughter was stunning and it was shared with wonderful family and friends. What more could you want. I got my card finished for this week and am now working on the next one. Life is good. I hope you have wonderful things in your life that bring you joy. Stuff like family, friends things that you enjoy like making cards or crafting. I love it, it's one of my favorite things. 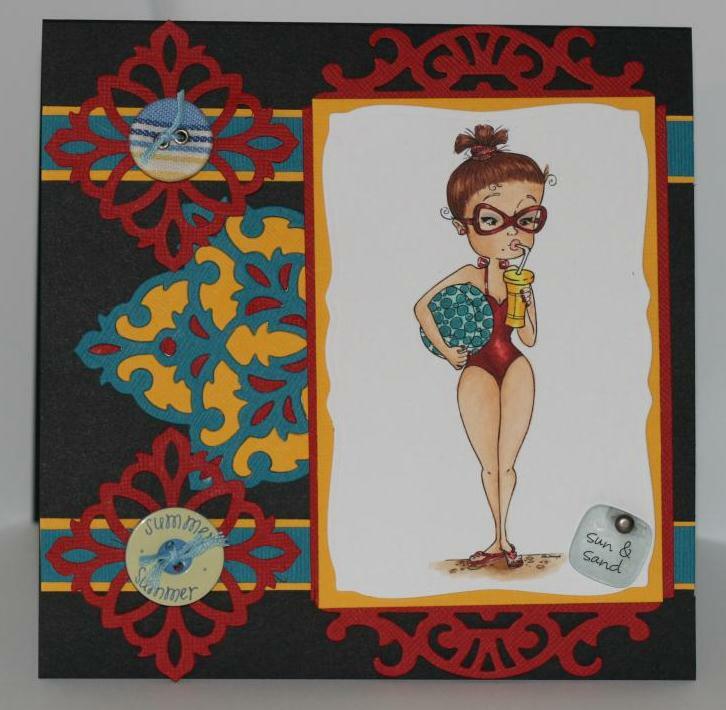 To just go to my scrapbook room and let the creative juices flow. On that note I hope that you have that kind of joy when you create, I'm hoping to see you stop on the Whimsy blog (click here) to check out the Dt's wonderful creations this week. It's an creative one "anything goes". So make a creation and put it up, link it to the Whimsy blog for a chance to win some really great digital stamps from Whimsy Stamps. Hope to see your card. 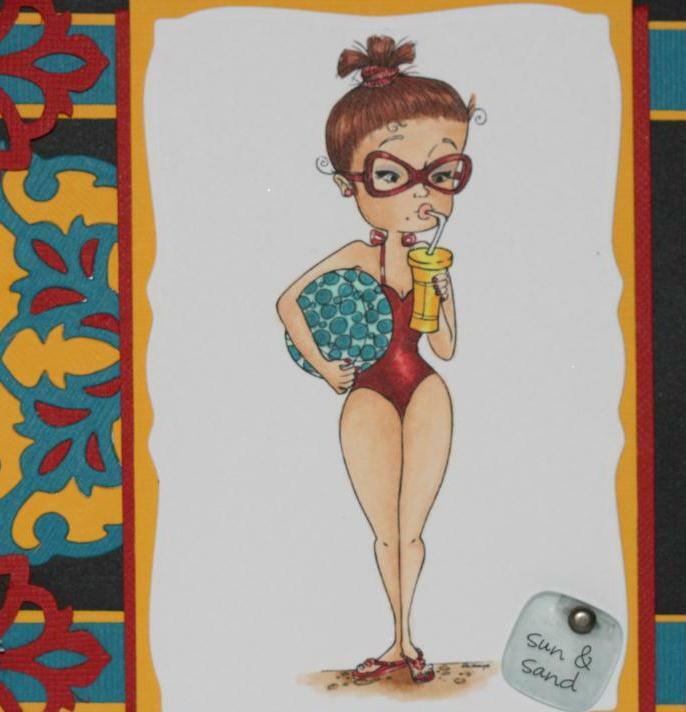 Here's my card for this week, I used a super cute image from Lia Stampz called Marie from Whimsy Stamps. A super cute summer image. I used Fancy Tags Three by spellbinder to make the framed piece around my image. I just shimmed up the one end so that it wouldn't cut through my paper. It actually worked pretty good. The Damask spellbinder I cut out three times in each a different color then pieced it all together to get a multi colored look. 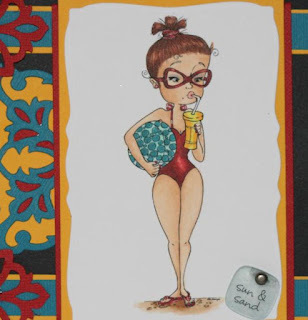 Supplies: Marie by Lia Stampz from Whimsy, Bazzill cardstock, Copic markers, Spellbinder -Damask Motifs & Fancy Tags Three, Miscellaneous embellishments. Super awesome friend, love that new tags die. Also the image is pretty darn cool, great colors too! Way to go, and you also have a fantabulouso day! Cheers Friend!